Key item details are always displayed on the top half of the Works form. Clicking each tab displays additional work-related information. 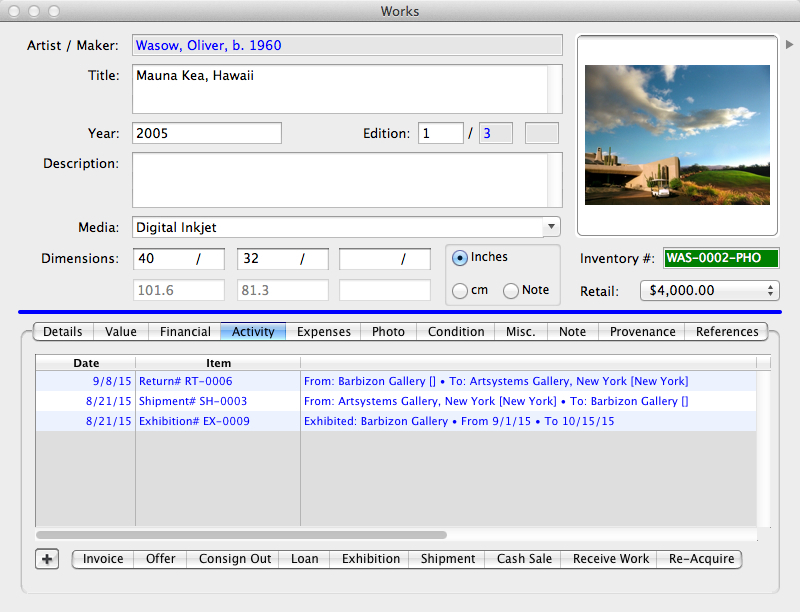 Clicking on Blue Text always directly displays that related record.Inch/centimeter conversions are automatic.Inventory Numbers can be generated automatically based on your own pre-determined codes.The color in the Inventory Number field denotes the work's sales status: sold, available, on loan or consignment, on reserve, or inactive.The stripe color denotes the work's initial ownership status as it came to you: consigned to you, owned by you, owned with a partner or partners, or as a non-inventory item (something in a client's collection, perhaps). Colors can be customized. 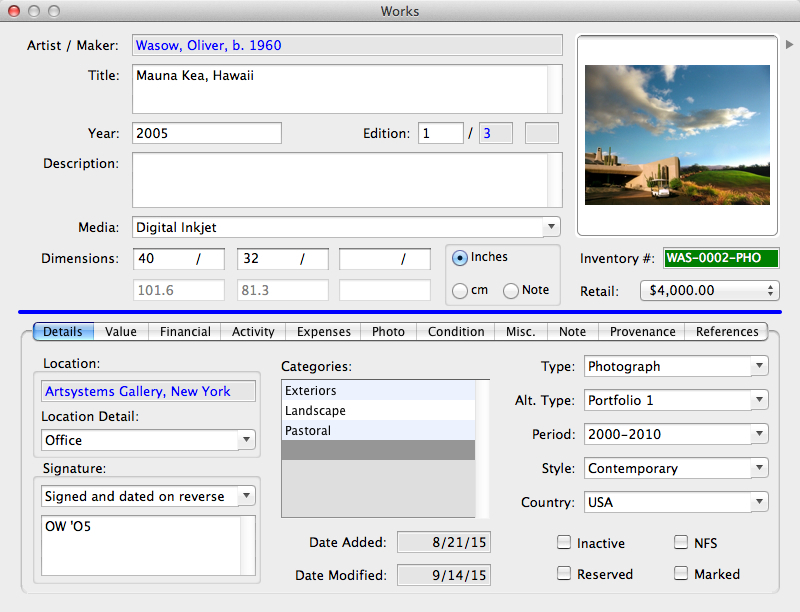 Pro automatically resizes and reformats copies of source images when attaching to a work record. 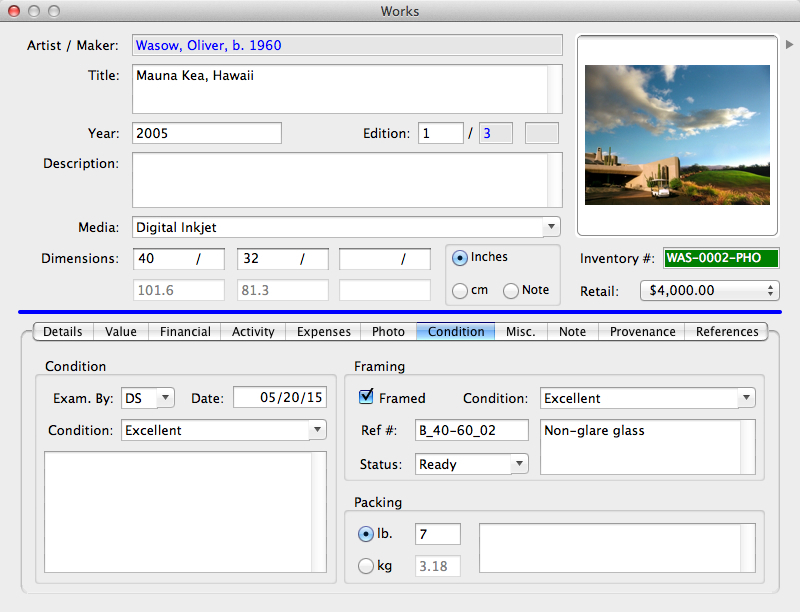 Using Pro, images can be emailed, exported for website and mobile app use, or displayed on any number of user-defined or standard reports and documents. 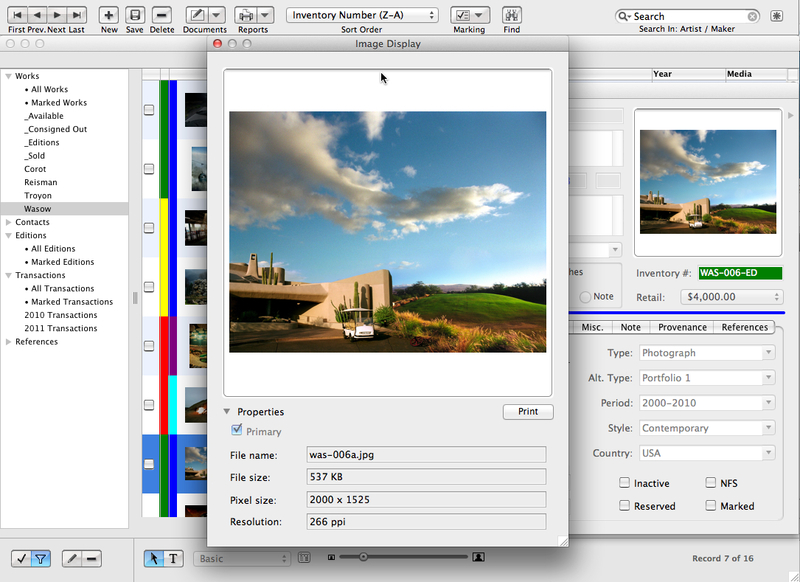 Display image thumbnails of variable sizes in the works spreadsheet view. Pro saves paths to image files rather than embedding them in the database, ensuring its stability and leanness for speed.Double-click on the Thumbnail View for a larger view. 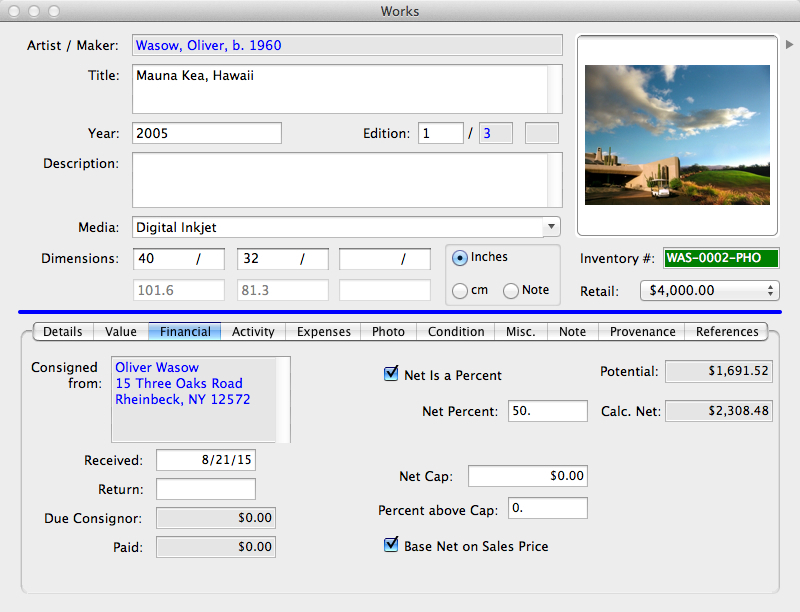 Add up to dozens of additional images to each work record — detail views, alternate alternate angles, etc. 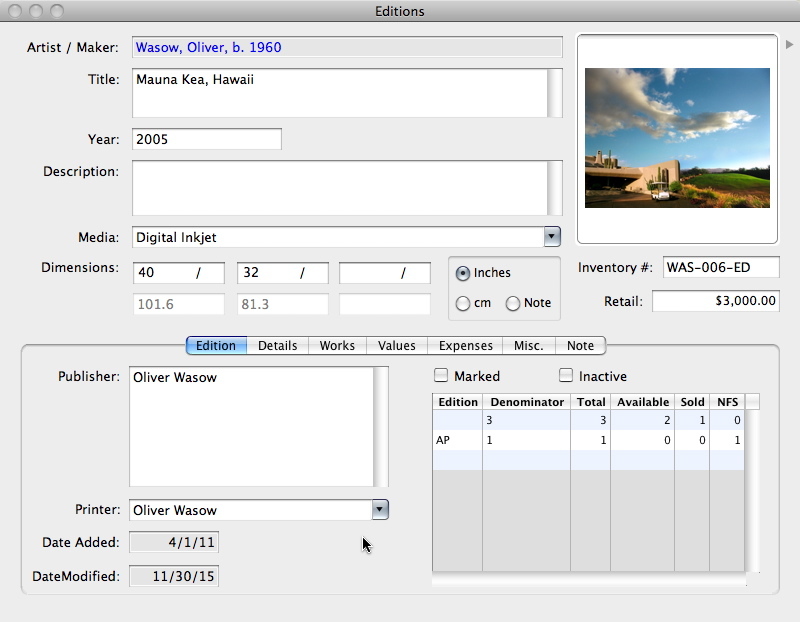 Pro includes an Editions module for creating templates for editions and managing individual works within an edition. Information common to all of the works in an edition can be entered one time into an Editions record.Select the Edition record when adding individual works from the edition, and all of the information entered in the Edition record, including the image, will be copied into each new Works record as the works are added. 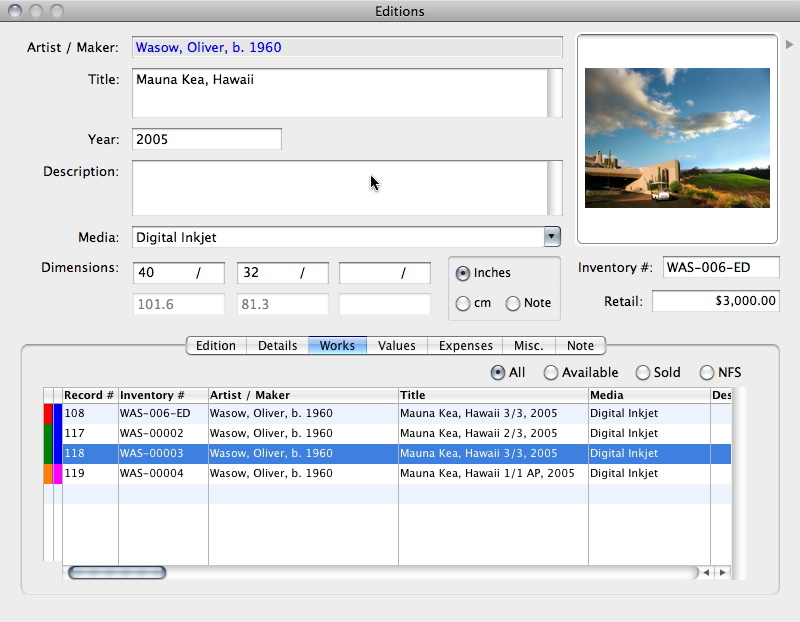 All works from the edition or a selected range can be added from the set simultaneously. One may view all works from the edition (as pictured) and the quantity sold and/or available directly from the Edition record. One may also view all Edition records in a spreadsheet list view. The Financials tab displays information on one's acquisition/consignment of the item (Purchased From or Consigned From, Net [as percent or currency amount]), its buyer or consignee and your potential or realized profit (taking accrued Expenses into account). Convert cost to and from any currency (not shown). Information is entered automatically through selections and entries from the add-Work forms, which leads one through adding an item. Select QuickBooks Pro accounts (optional) to integrate financials and eliminate accounting double entry. The Activity tab, which is linked to Transactions records, contains a display-only table that is automatically updated with each completed transaction involving the item (Consignments, Invoices, Shipments, etc.). Double-click on any line in the Activity tab to go directly to the associated transaction. The Activity tab includes Transaction shortcuts. Click on any Transaction tab at the bottom of the screen to initiate a transaction including the work (additional works may be added to the Transaction). The Condition tab provides fields for recording and updating the item's physical status. Additionally, if applicable, its frame's or pedestal's status may also be recorded, as well as the work's weight. Enter new designations in the Condition fields or choose from the list of previously saved choices. 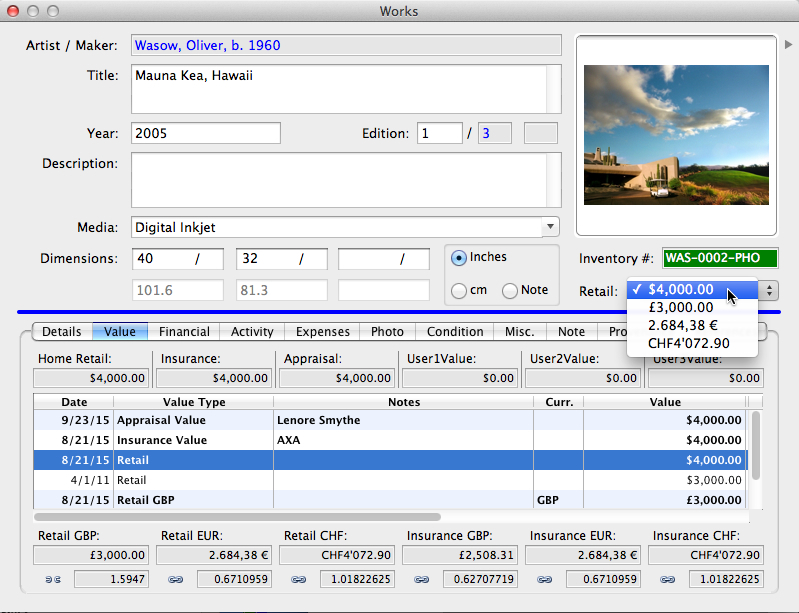 Extensive details can be added in the notes fields. The References section displays the Bibliographic items and Exhibitions that have featured the work and have been entered in the separate References module. 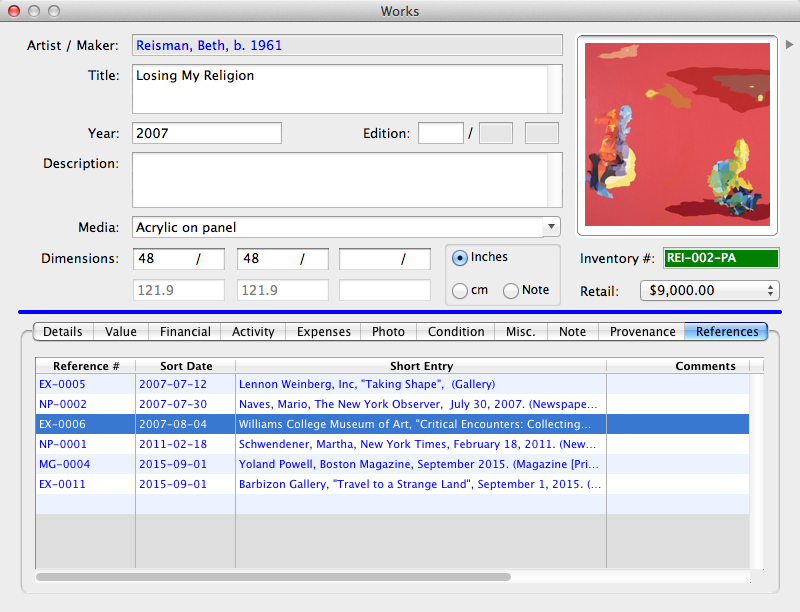 Previously entered Reference records can also be selected for a work directly from this Works tab. The Reference information automatically appears along with the Provenance in correct style format on the work's Infosheet. 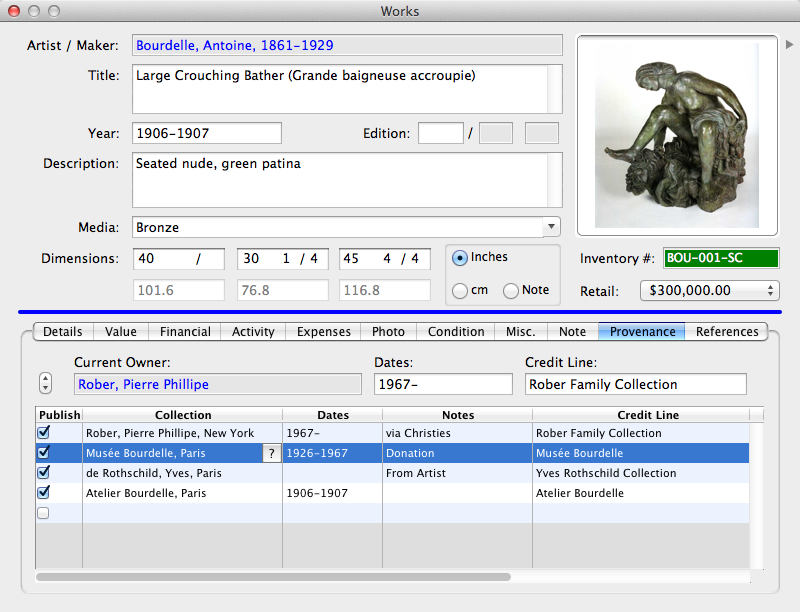 The Works Provenance section automates the recording of an item's ownership history — even linking to owners' records in the Contacts module, if applicable. This information can appear automatically on the item's Infosheet (or not, if so designated) and on a contact's Collection list. The current owner is automatically displayed on this tab when a sale is made, or can be added at any time via a 'lookup' from Contacts records.